“When we first moved here, we both were wondering why,” says Sofia Gonzalez from the desk of her home studio. After growing up 20 minutes north of San Francisco, the move she and her fiancé made a over a year ago to the Natural State definitely caused a shock. Now, though, she says, “I really love the pace of life here … plus Arkansas is beautiful.” She and her fiancé feel at home in Hillcrest, which has a vibe they can both relate to in Rock City. Their house also has the perfect space for an artist studio – light and open, with a perfect view of the raised beds in the backyard, which is somehow green even though it’s currently winter. Art has been a part of Gonzalez’s life as far back as she can remember. She recalls wandering around her yard with an easel at the age of five, determined to paint the nearby landscape. “I am an only child, so I always though of art as my friend, it still kind of is,” she laughs. Throughout high school she pursued it and refused to give it up in college. She studied graphic design and visual art at the University of San Francisco and when she graduated, she felt she could keep going. “My senior year of college is when I decided that I could actually do this,” she remembers. She decided to go to California College of the Arts, staying in San Francisco. “I realize now how fortunate I was to go to school there and be around such incredible museums and galleries,” she says. 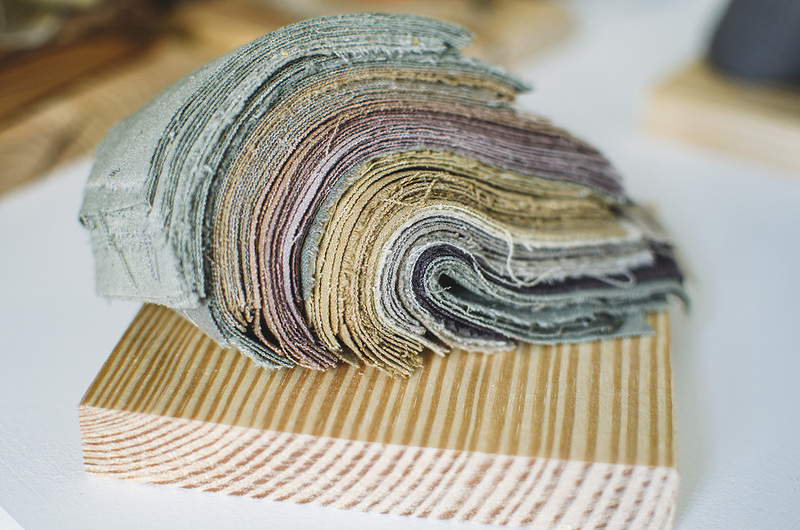 She began to experiment with natural dyes, turning her attention to textiles and fabrics. You have to see her work to truly understand the beauty of a finished piece. The vibrant creations are all colored with dyes created from different plants and vegetable materials she has collected. “Usually, I try to source all my materials from where I am, in my local environment,” she says, mentioning a project in graduate school that dealt primarily with her childhood backyard. She considers her process a bit like cooking. She takes things like onion skins, dandelions, cabbage, and more, and then boils the material. Eventually she’ll add her fabric into the mix – typically silk – and let it take in the resulting color. Of course, the process is a little more complicated than that, you can add modifiers to make dyes brighter or duller, and so on. And while Gonzalez takes really good notes on her resulting colors, so many factors affect her results, that the colors are different every time. Her resulting pieces are all about the color, and examining a multitude of topics including: storytelling, layering, memories, and place, particularly, landscapes. The dyes also act as direct tie to places for Gonzalez. 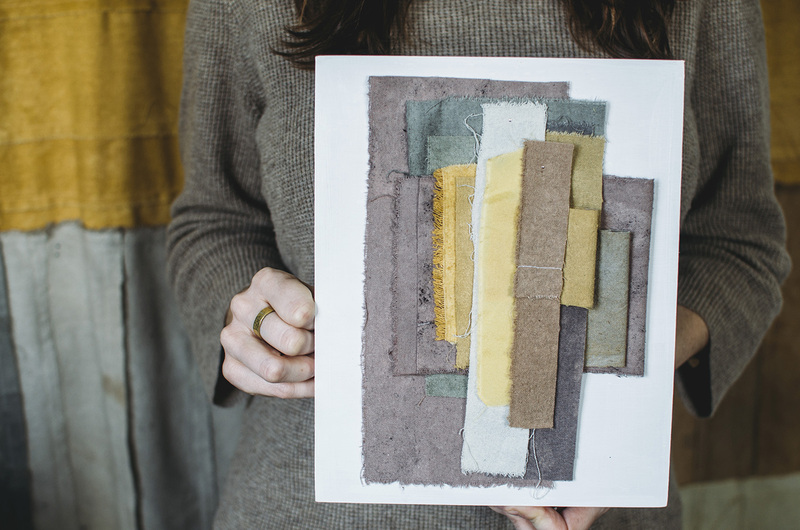 Her studio currently sports what look like watercolor maps, noting the places she picked up a particular material in her neighborhood, alongside smaller stitched together dyed fabrics. By collecting plants she may not be familiar with she is learning about Arkansas. “It’s my way of connecting to a place,” she adds. She wishes that the galleries were a little more experimental, like the Good Weather gallery in North Little Rock. But, she likes that the local scene is not cut-throat competitive. “I like how comfortable and open all the galleries are here as well as the reception shows. You don’t have to feel like they just think you’re talking to them to get in their gallery,” she says. She’s begun teaching as an adjunct professor at UALR, which she feels has really opened doors for meeting people. She loves seeing Little Rock move in the right direction sustainability wise – including things like the Hillcrest Farmer’s Market and LRFU – but she wants to see more of that. To learn more about natural dyes, join Gonzalez on Feb. 20 for a workshop in Hot Springs. If you haven’t already, check out more of her work here, and here.